Is there a way to use one computer by several users simultaneously? Indeed, this is the question burning in mind of most home users. If you need an extra PC at home for a little cost, consider using dual monitor system on one computer. IBIK company is ready to offer you an advanced ASTER dual monitor system designed to organize an additional computerized workplace with ease. Frankly speaking, when it comes to sharing a single computer, using dual computer monitors is a way to reduce tension between different members of your family. Our dual monitor system will make usage of your PC more productive allowing you to equip another workstation just on the basis of your home computer (an ordinary desktop or laptop). Forget about thin clients and terminals as now you can have one computer with dual monitors and enjoy it's top-notch performance. Installation and setup of our ASTER dual monitor system is easy and can be completed by any home user. Just by connecting a one more standard monitor, keyboard and mouse, you can enhance your PC potential and run dual monitors on one computer in the same way like using two independent PCs. 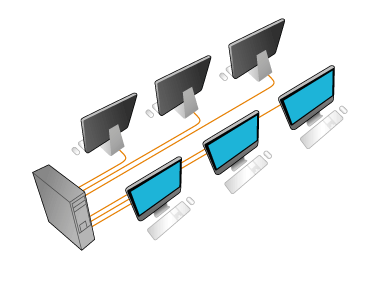 Moreover, when using dual computer monitors on the base of one computer system, two users working simultaneously can easily run different programs as well as access the same applications on their personal screens. The main benefit from using dual monitors with a single computer unit is significant cost savings as you will need to upgrade only one PC to obtain another workplace. In addition, running one computer with dual monitors means a lesser dose of harmful radiation as well as a lower noise level and additional electric power savings. Don't miss your chance to turn one computer system into two – take advantage of our innovative ASTER dual monitor system right now!